Spear-carrying guards who serve the Queen of Hearts. They fear the short-tempered queen and are careful not to irritate her. Marched onto the scene in "Alice in Wonderland" (1951). Troops with heavy axes who serve the Queen of Hearts. They fear their short-tempered queen, and are careful not to irritate her. Guards in the service of the Queen of Hearts. They fear her temper and will do anything she orders. Soldiers in the service of Wonderland's ruler, the Queen of Hearts. Seeing as they are quite fond of keeping their heads attached to their shoulders, they make a point not to defy her. A guard who serves and fears the short-tempered Queen of Hearts. The Card Soldiers, also known as Playing Cards, are soldiers who serve the Queen of Hearts in Kingdom Hearts, Kingdom Hearts Chain of Memories, Kingdom Hearts 358/2 Days, Kingdom Hearts Re:coded and Kingdom Hearts χ. The Card Soldiers carry out her every order, always afraid of being beheaded. They serve as a member of the boss fight against the Crank Tower and the Queen of Hearts in Wonderland. The Cards can be seen alongside their Queen during Alice's trial. After Sora and his friends find proof of Alice's innocence, the Cards attack them by order of the Queen, who doesn't believe she is innocent. When Alice is kidnapped, the Queen orders the Cards to search everywhere for her, but they don't succeed, since Alice is no longer in Wonderland. The Cards appear as figments of Sora's memories in Wonderland. They are fought again alongside the Queen of Hearts, and when defeated, Sora obtains their Enemy Card. The Playing Cards are in charge of protecting the Queen's hedge mazes. They are also sent to find three suspicious figures for the Queen. The Cards are ordered by the Queen to get rid of the Bug Blox problem. After Data-Sora unlocks Wonderland's Keyhole and gets rid of the Bug Blox, the Card Soldiers return to their regular patrols. The card soldiers come in two varieties; red ace of heart soldiers and black ace of spades soldiers. Both have bodies that are identical to their respective real-world playing cards, but sprout arms, feet, and rather flat heads (neither type has visible legs or eyes, or a neck). The heart soldiers have red heads shaped like an upside-down heart. They have a pale-skinned, heart-shaped face showing, indicating that the red is some sort of helmet, a bright red, vaguely heart-shaped nose, and a small, heart-shaped mouth. Two red semi-circles are present on either "shoulder", perhaps representing pauldrons. They have spindly arms and large (in comparison to their arms), red gloves, as well as floppy red shoes. They carry red lances as weapons, each lance tipped with an upside-down heart. The spade soldiers share the same structure as their red counterparts, sporting the same "paulrons" and shoes, albeit theirs are colored black. Their noses are also black and shaped like an upside-down heart (a spade without the "handle"). Their mouths share this upside-down heart shape. Their faces are pale like the heart soldier's, while their "helmets are shaped like spades, with parts of the design, specifically the handle and lower half of the spade, continuing onto their card bodies. Their black gloves are slightly closer-fitting than their red-colored brethren. Finally, they carry black axes as weapons. Unlike the red soldier's lances keeping with the heart theme of the soldiers, these axes do not show any spade design. 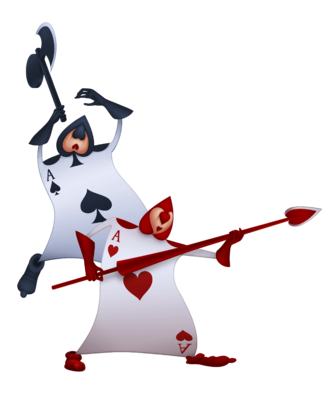 Along with Alice, the Queen of Hearts, and the other inhabitants of Wonderland, the Card Soldiers appear in Disney's Alice in Wonderland. The playing cards make up a very large army for the Queen and King. This page was last edited on 3 April 2019, at 16:57.